While most of the county freezes through one of the coldest Januaries in decades, news on the Earhart front isn’t much better here in sunny northeast Florida. Things can always be worse, of course, but that doesn’t mean I can’t complain, and in the case of the Massey Air Museum and Aerodrome, “a grass airfield on the Eastern Shore of Maryland, and the dream of four gentlemen with the love of aviation,” according to its website, the least I can do is register a mild protest. If their recent behavior is any indication, the Massey management’s proclaimed “love of aviation,” which impels it to operate its facility “just like one of the thousands of small town airports of the Thirties, Forties and Fifties,” doesn’t extend to the slightest interest in or respect for the legacy of Amelia Earhart, America’s original “First Lady of Flight.” These people should be ashamed of themselves. This set of four postage stamps issued by the Republic of the Marshall Islands in 1987 to commemorate the 50th anniversary of Amelia Earhart’s last flight. The stamps (clockwise from top left) are titled: “Takeoff, Lae, New Guinea, July 2, 1937; USCG Itasca at Howland Island Awaiting Earhart; Crash Landing at Mili Atoll, July 2, 1937; and Recovery of Electra by the Koshu.” Frank Benjamin elarged and mounted these stamps, and they are an impressive part of his unique Earhart display. In my most recent posting (Jan. 12, below) I wrote about Frank Benjamin’s great Earhart exhibit, and briefly described the shabby treatment he received when he went to the great trouble of bringing it to the Dec. 1, 2013, “Hangar Party” event at Massey so that the several hundred souls who attended that day might learn something true and worthwhile about the disappearance of Amelia Earhart. Not only was Frank roundly ignored, he was prohibited from selling his T-shirts and copies of Truth at Last. But Massey wasn’t finished rubbing Frank’s face in their contempt for the truth, and a few days ago he received, via snail mail, Massey’s latest newsletter. Earhart display there alongside the dining facilities in plain site of everyone! Boy, was that disappointing; what a crock! Only about a dozen took the time to view the display, but still, it was there, and I stood by it all afternoon.” The online version of Massey’s newsletter offers only a few paragraphs and several photos of the event; once again, not a whisper about Frank’s Earhart display can be found. Sadly, Frank has learned the hard way exactly how the American establishment regards the truth in the Earhart case – with the utmost contempt. To begin with, and thanks to our pathetic school system’s revisionist history curriculum, most have no clue about who Amelia was. Many others simply don’t care anymore, but most of those in positions of power and influence, even in little airports in burgs like Massey, are determined to keep a lid on the truth. Explanations, motivations and rationalizations will vary depending on the situation, but with few exceptions the bottom line is always the same: The unpleasant truth about Amelia Earhart is not welcome here. It’s no exaggeration to say I’ve experienced over a thousand rejections in recent years during my mostly futile attempts to get out the word about the Earhart truth. I’ve learned who my friends are, but have also gained a few along the way. As a result, I’m in a unique position to understand this phenomenon of establishment contempt, whether it’s encountered in radio, newspapers, at the Knoxville Convention Center or at the Massey Air Museum and Aerodrome. But getting others to understand this “pan-institutional aversion to the truth,” as I describe it in the closing chapter of Amelia Earhart: The Truth at Last, has been nearly impossible. Frank Benjamin, I think, can now be counted among the enlightened few who really do get it. If not, he’s getting very close, based on the close of his Jan. 22 message. Frank Benjamin is an Amelia Earhart enthusiast par excellence. Frank, 74, a semi-retired college science teacher who lives with wife Suzanne in the bedroom community of Galena, on Maryland’s eastern shore, has distinguished himself in recent years for his avid support of the truth in the Earhart disappearance. He contacted me several years before Truth at Last was published, in connection with his own serious probe into a murky area of Earhart research, and even drove down twice to Knoxville, Tenn., from Galena to visit. On one occasion, he assisted me at a veterans business event at the Knoxville Convention Center, helping me accost unsuspecting East Tennesseans with the truth in the Earhart case and the new book where they could find it. We sold just six books that day, but consoled ourselves by telling each other what a great job we did “planting a few seeds.” Although a few thousand souls might have passed our booth, we were able to talk to perhaps a hundred or so. Overall, the day’s experience was instructive — and very deflating. Most couldn’t have cared less about Amelia Earhart. Frank is also quite a world traveler; he’s been to the Marshall Islands and Saipan more times than he can recall, and hopes to return at least once more to the Marshalls to visit Mili Atoll and the uninhabited and nearly inaccessible Barre Island, where our best evidence indicates Amelia made her wheels-up landing in the Mili Lagoon. Nearly every summer Frank flies to Japan to walk its more remote beaches in search of the decorative glass balls that local fisherman use to secure their nets and eventually wash ashore to be claimed by enterprising scavengers like Frank. Frank Benjamin’s fascinating Earhart memorabilia display at Atchison, Kansas, during the July 2013 Amelia Earhart Festival drew considerable attention. Over recent years, Frank has been assembling a fascinating exhibit – some might call is a display – that reflects his devotion to the truth in the Earhart case (pictured above, at Atchison, Kansas in July 2013). Among the many curiosities comprising this one-of-a-kind Earhart memorial are an elegant print of a painting of Admiral Chester W. Nimitz, commander in chief Pacific Fleet, which Frank procured from the Navy History Center at the Navy Yard in Washington along with another, similar print, which Frank generously presented me; a beautifully enlarged and mounted set of four postage stamps issued by the Republic of the Marshall Island in 1987 to commemorate the fiftieth anniversary of Amelia’s landing at Mili Atoll; and an original painting depicting a forlorn Amelia behind bars at Saipan’s Garapan jail, as reported by many native witnesses to researchers such as Fred Goerner, Joe Gervais and Vincent V. Loomis. 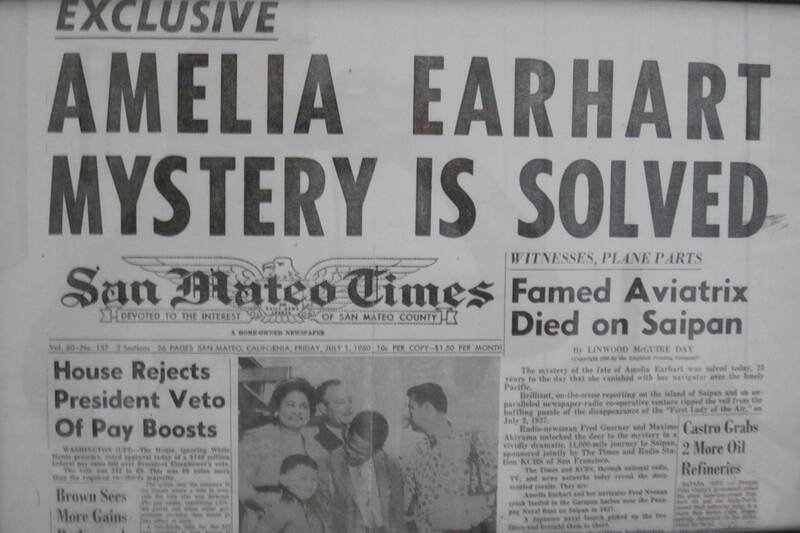 Many photos, clippings and other assorted memorabilia, including the front page of the July 1, 1960 San Mateo Times, proclaiming “Amelia Earhart Mystery Is Solved,” direct from Saipan and courtesy of Times reporter Linwood Day and Fred Goerner (below), make Frank’s display unforgettable for anyone with even a modicum of interest in the Earhart story. This headline, from the July 1, 1960 San Mateo Times, was ignored by every major newspaper and media outlet in the United States. It remains as true today as it was in 1960. On Dec. 1, Frank brought his exhibit to the Massey Aerodrome & Museum, in nearby Massey, Md., hopeful that thost attending its Eleventh Annual Open Hangar Day would be drawn to the alluring layout, seeking to learn about the Earhart “mystery.” Many hundreds came to Massey for the Open Hangar Day, Frank recalled, but very few bothered to approach him or his display. In deference to Frank’s wishes, I won’t name any of better-known personages who attended the 2013 Amelia Earhart Festival during the third week of July, whose less-than-friendly treatment of Frank and his message revealed their support for the establishment’s aversion to the truth, reflected in a policy that forbids even the mention of Amelia Earhart and Saipan in the same sentence. After being led to believe by Chamber of Commerce types that he would be allowed to sell his special Earhart “MIST” (Marshall Islands-Saipan Truth) T-shirts screened with the same image of an imprisoned Amelia that graces his commissioned painting (below), and several dozen copies of Amelia Earhart: The Truth at Last at Atchison, event officials coldly informed Frank that such activity was prohibited soon after he arrived. This haunting image of Amelia Earhart in Japanese captivity in Saipan’s Garapan jail adorns an expensive painting commissioned by Frank Benjamin, as well as several dozen T-shirts he hasn’t been allowed to sell at two events he’s attended. The reception Frank received at Massey is far more reflective of the public’s vast indifference and lassitude when it comes to the fate of Amelia Earhart. Most under 60 years old have barely heard of her, and are hard pressed to tell an inquisitor anything about Amelia except that “she was lost in the Pacific Ocean, wasn’t she?” Certainly, many of our seniors, especially those over 85, are almost always interested, as many of them can remember sitting in front of their radios as children with their mothers and fathers, anxiously awaiting news of the lost fliers in 1937. Amelia’s loss is real to these people, and when I’m able to tell them what really happened, they’re usually amazed and appreciative. But 77 years of propaganda and lies have succeeded in convincing the vast majority of the American public that the Earhart mystery won’t be solved, so what’s the point, and who really cares anymore? This is the sad reality of the Earhart case, as Frank and I have learned up close and personally.